DAVID TYNER, a talented photographer who has contributed fifteen K7Waterfront homepage photos over the past two years, has moved to Ottawa. David is a wizard of night photography (among other things) and he will be missed! Above: photo of, and by, David Tyner. UNGENTLEMANLY CONDUCT via Preserve Our Wrecks, Kingston. KINGSTON'S ROBERT DAVIS FINISHED 12TH at the Laser North American Championships over the weekend. Does anybody know what this US Coast Guard vessel, and a barge, are doing at KPH? One guess: it's the only available wharf in-town? Hopefully this is just Environment Canada, low-balling the forecast, as they tend to. THE DISCOVERY CHANNEL today filmed a segment about the archeological work going-on in Kingston harbour. DIVING INTO THE PAST in today's Whig, about the archeological work going-on in Kingston harbour. See also CKWS-TV'S JUNE 4th REPORT, with video. THE FINAL CONCEPT PLAN FOR LAKE ONTARIO PARK has been released by the City. YEARS OF DEFERRED MAINTENANCE has come to the point of requiring a public meeting about a small stretch of Kingston Waterfront. The designs, to be implemented this summer, are the subject of an upcoming public information session on Monday, June 22, at 6:30 p.m. in Memorial Hall at City Hall, 216 Ontario St., and are now posted for review at www.cityofkingston.ca/waterfront/. The improvements are moving forward based on the City's Waterfront Strategy now part of Kingston's Recommended Draft Official Plan (cityofkingston.ca/officialplan/). We can't find any reference to this area of waterfront in Kingston's Recommended Draft Official Plan. Here are some photos of the area taken from the water. It looks like this has turned-into a major piece of work that can't be deferred any longer and will involve the closure of the West Street Launch Ramp for a period of time this summer. Here's the deal: Instead of decades of neglect, how about regular required and preventive maintenance? Instead of doing nearly nothing for decades, why not fix problems as they occur? Each spring, improve things a little bit. After a major storm, go down and check if anything washed-away. If so, fix it immediately. Above: this is what gabion walls eventually look like when you don't maintain them. As things appear now, with respect to the waterfront, Kingston's official plan isn't about better waterfront living or even clawing back what we've recently lost. The official plan is apparently more about doing obvious repairs, merely fixing things that should never have been permitted to remain broken in the first place. WATERFRONT ACCESSIBILITY DOWNGRADE according to a moronic report to Council last Tuesday night. Swimming flat-out prohibited at Esplanade Park, Everitt Park, and Patterson Park. Can you imagine? City Hall in the Harvey Rosen era is led by idiots! THE JUNE 2009 THOUSAND ISLANDS LIFE is up. Check out the terrific article titled The Wolfe Islander Is Missing, by current ferry captain Brian Johnson, about a gale in January 1950. Read the whole thing. DOWNTOWN POKER RUN PLUG-UP planned between Friday Aug 7th at noon to Sunday Aug 9 at 6 PM. Expect our spineless, gutless council to approve this. THERE'S APPARENTLY NO IMPROVEMENT since last July to the so-called "Beach Report" we're getting from the Health Unit. What's worse, it's nearly mid-June and the City of Kingston is still not listing beach quality information, or links to beach quality information, on its Environment or Recreation landing pages. The main problem with our Health Unit's Beach Report remains the lack of disclosure which is in stark contrast with the quality of beach information other areas are getting. The exact date the sample was collected. The specific level of E.coli found, as they do in Hastings & Prince Edward Counties and Toronto. How, exactly, was the sample collected? Was it from a boat perhaps hundreds of feet off-the-beach, or within a few yards of the waterline where children actually swim? The sampling history for each location so the propensity and volatility of E.coli contamination can be reckoned. Because just "Open" or "Closed" isn't nearly good enough. 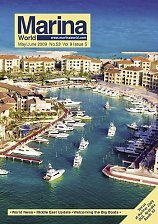 MARINA WORLD has a really (really) great feature on Kingston's Collins Bay Marina in it's latest issue. Check-out either just the article or the impressive full-issue (8 MB) online.